The Marin Housing Authority’s consideration of that option justifies the concerns of residents of Marin City’s Golden Gate Village that the authority’s planning and strategy is formula for gentrification. The Marin Housing Authority has wasted funds on studies aimed at providing cover for developers to extract value by adding market-rate density into an already overbuilt working class neighborhood — the very definition of gentrification. Is there a need for inclusive housing in Marin County? Yes. Should one single neighborhood, an historic neighborhood at that, be the focus of housing development? No. The planning that Lewis Jordan, the authority’s executive director, described is exactly what the recent Supreme Court case spoke to, disparate impact. We have seen this before and lost the fabric of great neighborhoods to what simply amounts to convenience and greed — people priced out of their community for developer profits! The Marin Housing Authority is doing the same thing, as usual, but somehow promising a different result. The plan Mr. Jordan describes is no more than auctioning the Marin City community’s future to a favored developer. Creating a path for development without gentrification is the reason why the Golden Gate Village Residents Council, which is the official voice for the residents of Golden Gate Village, worked with local economy experts, housing experts, federal and private institutions, and residents themselves to develop and share a community-centered plan, including precedents for outcomes and costs that are in line with restoring, not erasing, a legacy. First, we formally proved that Golden Gate Village is historically significant and should be preserved. 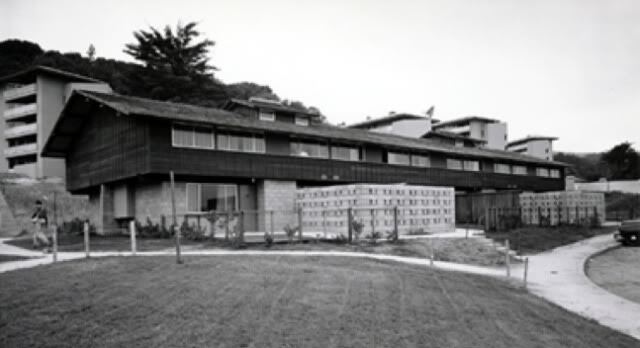 Golden Gate Village was not built to be like any public housing; the intent was to create a sense of home for black people who were left behind after the first phase of redevelopment in Marin City in the late ’50s. The property was designed by Aaron Greene, West Coast partner of Frank Lloyd Wright, embedding the same theory of design used in development of the Marin Civic Center, a national historical landmark. In fact, Greene was the architect who oversaw the development of the Civic Center, during the same time as Golden Gate Village took form. Golden Gate Village is, in reality and design, the “sister” property to the Civic Center. The deferral of maintenance of this public property was allowed to happen for over 10 years. This neglect of an historic property has been intentional, to create a case for demolition of a unique property. Case in point, the county Board of Supervisors will raise $21 million to repair just the roof of the Civic Center. They have the ability to do the same for its “sister” property to cover the cost of all necessary maintenance, at less than the cost of a roof. Mr. Jordan continues to ignore his obligation to communicate the interest of residents by failing to mention any aspect or even the existence of the resident plan in the quotes for this article. This omission reflects a continual refusal to recognize and share the fact that the Golden Gate Village Resident Council has had a detailed plan for funding and executing deferred maintenance, while at the same time revitalizing the local economy supports for this working class community. Lastly, the Marin City community is more diverse than any community in Marin and its housing density, by a factor of eight, is greater than our neighboring communities. Our community is at maximum, “built-out” in accordance with our community plan. Preservation and renovation of the neighborhood that exists, versus “demolition by diffusion” if that happens with infill development of market rate units, is the only answer that we will accept as truly resident-led and community-centered. Royce McLemore is a leader of the Golden Gate Village Residents Council, a former board member of the Marin Housing Authority.